When the 12 volt battery must be replaced,use the Prius designated battery. The 12 volt battery produces flammableand explosive hydrogen gas. Do not cause a spark from the batterywith tools. Do not smoke or light a match nearthe battery. The electrolyte contains poisonousand corrosive sulfuric acid. Avoid contact with eyes, skin orclothes. Wear protective safety glasses whenworking near the battery. If electrolyte gets in your eyes,flush your eyes with clean waterand get immediate medical attention.If possible, continue to applywater with a sponge or cloth whileen route to the medical office. If electrolyte gets on your skin,thoroughly wash the contact area. Ifyou feel pain or burn, get medicalattention immediately. If electrolyte gets on your clothes,there is a possibility of its soakingthrough to your skin, so immediatelytake off the exposed clothing andfollow the procedure above, if necessary. If you accidentally swallow electrolyte,drink a large quantity of wateror milk. Follow with milk of magnesia,beaten raw egg or vegetableoil. Then go immediately for emergencyhelp. Open the back door. Remove the luggagestorage box and 12 volt batterycover. If the back door does not open, see “Ifyou cannot operate back door opener” onpage 380. 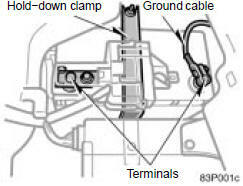 Check the battery for corroded or looseterminal connections, cracks, or loosehold−down clamp. a. If the battery is corroded, wash it offwith a solution of warm water and bakingsoda. Coat the outside of the terminalswith grease to prevent further corrosion. b. If the terminal connections are loose,tighten their clamp nuts—but do notovertighten. c. Tighten the hold−down clamp onlyenough to keep the battery firmly inplace. Overtightening may damage thebattery case. Be sure the hybrid system and allaccessories are off before performingmaintenance. When checking the battery, removethe ground cable from the negativeterminal (“–” mark) first and reinstallit last. Be careful not to cause a short circuitwith tools. Take care no solution gets into thebattery when washing it. If the 12 volt battery is disconnected orrun down, the power window and backdoor may not operate automatically andthe jam protection function will not functioncorrectly and does not open the backdoor after you reconnect, replace or rechargethe battery. In any of these cases,you should normalize each system. Tonormalize them, see “Power windows” onpage 43 and “Back door” on page 42. Before you disconnect the 12 volt battery,confirm the shift position is “P” and applythe parking brake completely. After you reconnect the 12 volt battery,shift the shift lever to “N” and confirm theshift position is “N” when the “IG−ON”mode is enabled. After connecting the cables, the hybridsystem may not start by pushing the“POWER” switch. In that case, push itonce again.